CCC is honored to accept the Sunshine Award from Ahh the Simple Life! It’s an award one blogger gives to other bloggers “who are positive and creatively inspire others in the blogosphere.” Carol Preibis, co-founder of Ahh the Simple LIfe, is a contributor to the CCC blog and also recently published an eGuide, Living a Good Life: Live a Meaningful, Happy and Fulfilling Life, which we reviewed here. Check it out! 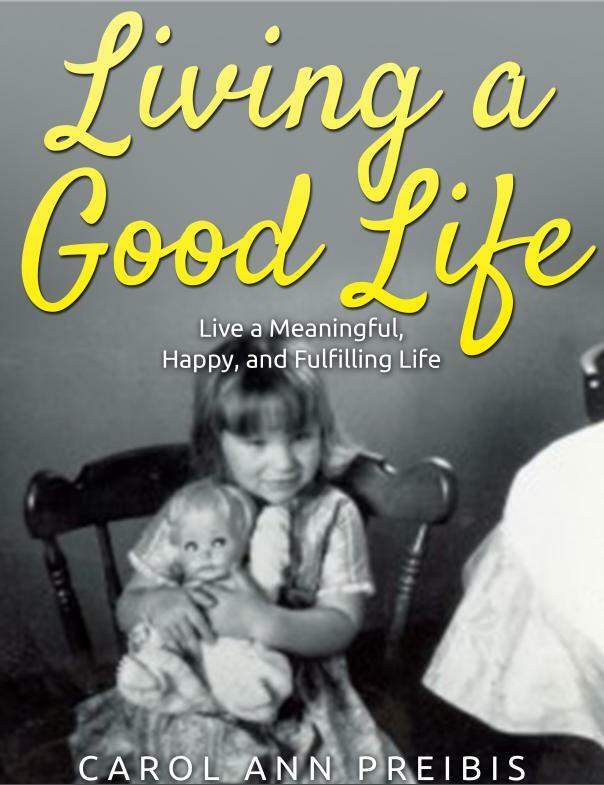 Are you living a good life? Read Ahh the Simple Life’s nominating post (and learn more about Carol!) here. 1) Why did you begin blogging, and what keeps you going? I started the CCC blog on April 7, 2012, during the formation of my company, Clearly Conveyed Communications. Our goal has always been to inform and educate our loyal readers in the ever-changing areas of marketing, writing and social media, although sometimes we take the scenic route. It’s been a strange and wild ride, but we hope you’ve enjoyed the journey. Sometimes we wonder what kind of impact we’re making, so it’s always refreshing to hear from you! 2) What is your favorite topic to write about? Although the diversity of the CCC blog seems to be a big draw, I love to write, even about writing. Maybe especially about writing. Our series on the writing process is my favorite series to date on this blog. My favorite series on the CCC blog is about the writing process. Have you read it? 3) What is your favorite inspirational film? While Rocky’s victory over Apollo Creed is the epitome of the classic underdog story, I love Field of Dreams. (We even blogged about it, in relation to blogging of course.) Not only does this movie focus on baseball, it’s message of being selfless and following your dreams still resonates today. Let’s face it: some people will think you’re crazy for following your dreams, and listening to a voice in your cornfield ranks right up there. My favorite inspirational film outside of the sports world is Goodwill Hunting. 4) How would you describe your perfect day? My perfect day would begin when I wake up naturally, no alarm in sight. After taking in the amazing view, I’d saunter downstairs to brew some espresso for a delicious, handcrafted latte, which I’d enjoy with fresh fruit and peanut butter on toast. The rest of my perfect day would be spent reading, writing and enjoying nature, via a trail run or hike. After a vigorous swim (and maybe some paddle boarding), we’d grill some mouth-watering fish for dinner and sit around the fire, toasting s’mores and telling stories. 5) What is the greatest challenge facing humanity today? While our challenges are numerous, so many come back to the massive (and growing) income inequality problem. It’s disturbing how quickly people label someone not firmly upper middle class as lazy or ignorant (or both). Teachers, social workers and entrepreneurs may be some of the hardest-working people you meet, but their skills aren’t valued in our society nearly as much as professional athletes and rock stars. (No, all entrepreneurs aren’t Elon Musk or Mark Zuckerberg.) It’ll be interesting to see how this issue affects all of us in the coming years. 6) If you could travel anywhere on the globe, where would you go? I would love to travel nonstop, experiencing other cultures and traditions, although I would make Italy (or a tropical island) my home base. I’ve long been interested in exploring my Italian roots, and I love water. Someday, I’ll wake up to a beautiful water view. What activity makes you happy? What’s your favorite song, and why? What’s one thing that you have learned this year? Who has been a mentor, role model or hero at any time during your life? What’s something that your blogging audience doesn’t know about you? While our nominees are under no obligation to acknowledge or accept their Sunshine Award, we’re grateful of what they bring to the blogosphere. Take a few minutes to visit their blogs and explore what makes them tick. We think you’ll be glad you did. Congratulations to our nominees, and a heartfelt thank you to Carol Preibis at Ahh the Simple Life for the nomination. One of the biggest blessings of blogging is the fellow bloggers that you meet, and Carol is at the top of my list. We’d also like to thank our loyal readers! Without you, we’d be writing to ourselves in a public forum. We hope that you continue to find our content valuable and take a moment to drop us a note once in awhile. In turn, we’ll keep on keeping on trying to educate, inform, entertain and inspire. Hello Jaime, Thanks for taking up the challenge! I found your answers to be very interesting, and discovered that we have a few things in common. I also love Field of Dreams, and my perfect day would be quite similar to yours! Thank you for the nomination! It means a lot to me. You posed interesting questions which were fun to answer. It does seem that we have quite a bit in common, including our perfect day! p.s. It was fun to read your answers too. Very insightful!